The following is an explanation of symbol conventions , voltage polarities and current directions for npn and pnp BJTs. The goal is to help understand these characteristics but not on the physical level of electrons and holes. The following figure shows practical operation of each BJT in the active mode. When looking at a BJT, the easiest way to decide whether it is npn or pnp is to look at the emitter, which is always modeled as the arrow. If you remember that the arrow tail is always at a ‘p’ node and the tip is at an ‘n’ node, you can easily decide whether the BJT is npn or pnp. Remember that the collector and emitter are always either both ‘n’ or both ‘p’. It is important to know which direction the voltage’s will appear positive when we begin using nodal analysis to solve BJT circuits. Typically, there will be a voltage drop of .7 V over the nodes that will be used in these calculations. Whether or is positive is decided by the type of BJT. The voltage polarities are flipped between pnp and npn BJTs. Obviously, the only difference in the symbols between the two types of BJTS is the arrow, which is the emitter. If we remember the tip of the arrow is the lower voltage, we are able to deduce that for an npn BJT and for pnp. To be in the active mode, a BJT’s collector-emitter voltage must be above approximately .3 V. As above, this voltage polarity is reversed between npn and pnp BJTs. To determine, whether or should be positive, we can use our deduction of the base-emitter voltage polarity. The voltages, in active mode, drop from collector to base to emitter in npn BJTs and from emitter to base to collector in pnp BJTs. So, if we have figured out that we are using an npn BJT because was a positive .7V, we know that the base voltage is higher than the emitter voltage. From here we know the collector must be higher than the base, and therefore, higher than the emitter. We have just figured out that must be greater than the .3V to be working in active mode. Using the same logic, must be greater than .3V for a pnp BJT to remain in active mode. Current directions are very simple to figure out. Just use the arrow. The collector and emitter currents always go in the direction of the arrow in active mode. The base current is a little more tricky to figure out, but is also fairly obvious when using the arrow as a reference. As you can see in the above npn circuit, where the arrow is ‘pointing’ away from the base, the base current flows towards the BJT, in the direction the arrow is pointing. Oppositely in the pnp circuit, the base current flows away from the BJT, in the direction the arrow is pointing. 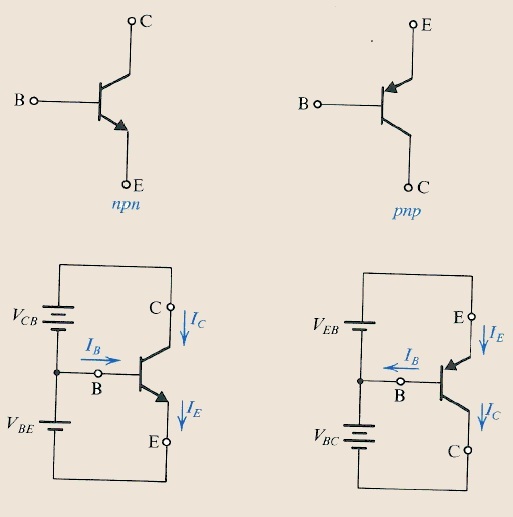 There is a table of basic equations listed in my post titled “BJT Transistor Nodal Analysis” which would allow us to calculate each current using a different current, but using Kirchhoff’s Current Law, knowing two currents, we could calculate the third. For a npn BJT, and for a pnp BJT . Note that both of these equations evaluate to .